McGeoch, Melodie A. Shaw, Justine D. Terauds, Aleks Lee, Jennifer E. and Chown, Steven L. 2015. Monitoring biological invasion across the broader Antarctic: A baseline and indicator framework. Global Environmental Change, Vol. 32, Issue. , p. 108. Hughes, K.A. Pertierra, L.R. and Walton, D.W.H. 2013. 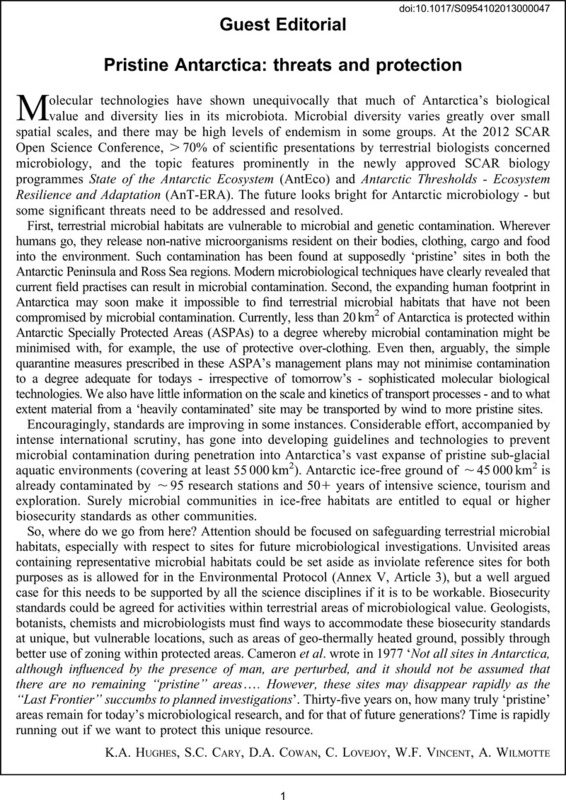 Area protection in Antarctica: How can conservation and scientific research goals be managed compatibly?. Environmental Science & Policy, Vol. 31, Issue. , p. 120. Chong, Chun Wie Goh, Yuh Shan Convey, Peter Pearce, David and Tan, Irene Kit Ping 2013. Spatial pattern in Antarctica: what can we learn from Antarctic bacterial isolates?. Extremophiles, Vol. 17, Issue. 5, p. 733.